Think back to your earliest retail experiences. Whether it was buying sweets in a corner shop, or buying your first album – these are the kind of memories that stick. We’ve all seen the incredible change the past twenty years of digital technology has brought to the retail industry. And in response, countless new innovators have emerged to help shift traditional retail experiences into the digital era. Today, the smartest retailers are embracing a new model of business: unified retail. Bringing together what shoppers love best about both physical and digital shopping, retailers are delivering a seamless blend of the two, and realising new efficiencies along the way. It’s August 1994, and 21-year old entrepreneur Dan Kohn just made history. How? He sold Sting’s Ten Summoner’s Tales on CD to a friend in Philadelphia, entirely online, in what would become the world’s first encrypted online transaction. Less than a year later, Jeff Bezos would similarly make history as he began selling books from his garage under the business name Amazon. 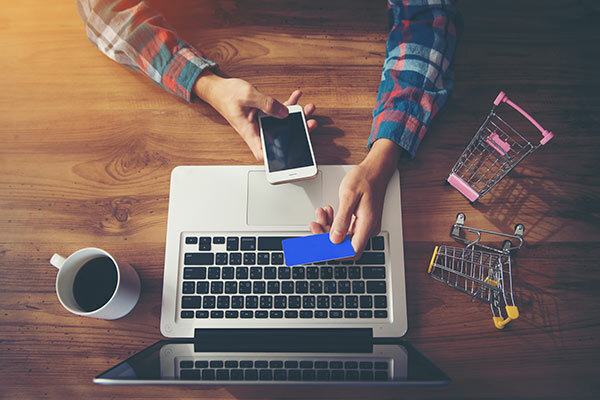 By the year 2000, online transactions accounted for 0.8% of all UK retail expenditure, and while it may not sound like a lot, retailers were quick to feel the burn of online competition. As this competition intensified, retailers knew they had to turn the disruption into an opportunity. Soon, online sales became table stakes for even the most traditional bricks-and-mortar retailers. However, for many retailers, this new digital channel grew in isolation from existing physical channels. The result? A customer experience that can’t be optimised because it isn’t unified. Did you know that 62% of shoppers still prefer to shop in store? It seems that no matter how immersive they’ve become, online shopping experiences haven’t replaced the real thing. Plus, shoppers are quite happy to move from one channel to another when they have to: 28% of millennials still turn to face-to-face retail support in the first instance when they can’t find what they’re looking for online. The writing’s on the wall: a retail model that seamlessly unites online and offline experiences is well overdue. Seamless, unified experiences offer retailers the perfect opportunity to stand out in a competitive market. And it’s not a one-way transformation. While bricks-and-mortar retailers move online, digital-native businesses are moving into physical spaces. Whatever their traditional model, more and more retailers are headed for that unified sweet spot in the middle. Just look at the checkout-free ‘Amazon Go’ stores coming to the US. Customers can walk around, pick up groceries and have them automatically added to their Prime account – all without queueing at a checkout. The company’s trademarking activity strongly suggests such shops will be trialled in the UK sometime in 2018. Imagine the economic advantages of a retail store with no physical inventory. With unified retail, this is entirely possible. In fact, the now-Walmart-owned menswear brand Bonobos took this idea and ran with it. Their stores serve only to showcase items, while inventory is kept in a fulfilment centre for fast customer dispatch upon purchase either online or in-store. And by doing away with the processes of traditional, physical retail, Bonobos’ staff can focus solely on the customer experience – delivering the kind of 1-on-1 attention that drives brand loyalty. Unlike its digital competition, a bricks-and-mortar retailer already has an established presence on the high street. And in the new world of unified retail, far from being a millstone around their necks, this property portfolio offers a key advantage over younger online retailers. Put simply, traditional retailers already have one vital, and sometimes tough to acquire, piece of the unified retail puzzle, making it easier for them to deliver the best of both worlds. As retailers work ever harder to differentiate on customer experience, unified retail is only going to become more attractive. Especially since – in addition to all the benefits listed above – unified retail offers new ways to capture and capitalise on customer data. From in-store sales assistants noting customer preferences on their tablets, to marketing teams using those insights to deliver more relevant offers – connecting online and offline is going to let retailers engage their customers like never before. Ready to learn more about unified retail? Explore our interactive Unified Retail page to see what a unified retail experience looks like, and discover our six tips for getting unified retail right.